Those who run the budget at companies must ensure return on investment from every activity that they put dollars behind -- otherwise you wouldn’t have resources to do your job. Trouble is, solidifying those resources and proving they’ll be worth the investment can definitely be a challenge. Whether you’re tasked with managing advertising spend or budgeting for events, this handy list of free calculator tools will help you prove the return on investment (ROI) of the programs and budget you need to grow your business and scale over time. Event marketers know how challenging it can be to attribute leads, pipeline, and revenue from events. 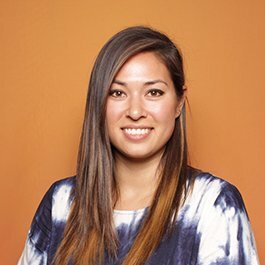 Luckily, Attend.com created an event ROI calculator to help your events team determine the cost of the event, the benefits -- both quantitative and qualitative -- from the event, and how those factors translate into revenue generated. In short: This calculator will arm you with the numbers your executives will be looking for after running any event for your business. Paying for ads can be risky if budget is tight -- who knows if it’ll pay off? But using the HubSpot Ad Spend ROI Calculator will help you break down your budget, set a price for how much you’re willing to spend per click, target your conversion rate, set a value for how much your customers are worth from ads, and turn around with a value for the return on your ad spend based on your starting budget. Growth marketers know that conversion rate optimization is critical to an inbound marketing strategy -- thus the need to prove all A/B tests pass with statistical significance. Kissmetrics created this A/B test significance calculator to help determine whether or not your conversion experiments are passing a significance test, ultimately to help you determine if changing that email subject line really did increase the open rate. Has anyone at your company ever asked, “How many leads per month does our sales team ACTUALLY need to hit their pipeline goals?” If not, this Leads Calculator (also known as a Service Level Agreement, or SLA calculator) will be your handy monthly tool to answer that question. This calculator will help you measure current sales close rates, assign dollar values to each of your major lead sources, track monthly lead generation by channel, and commit to a monthly lead goal. 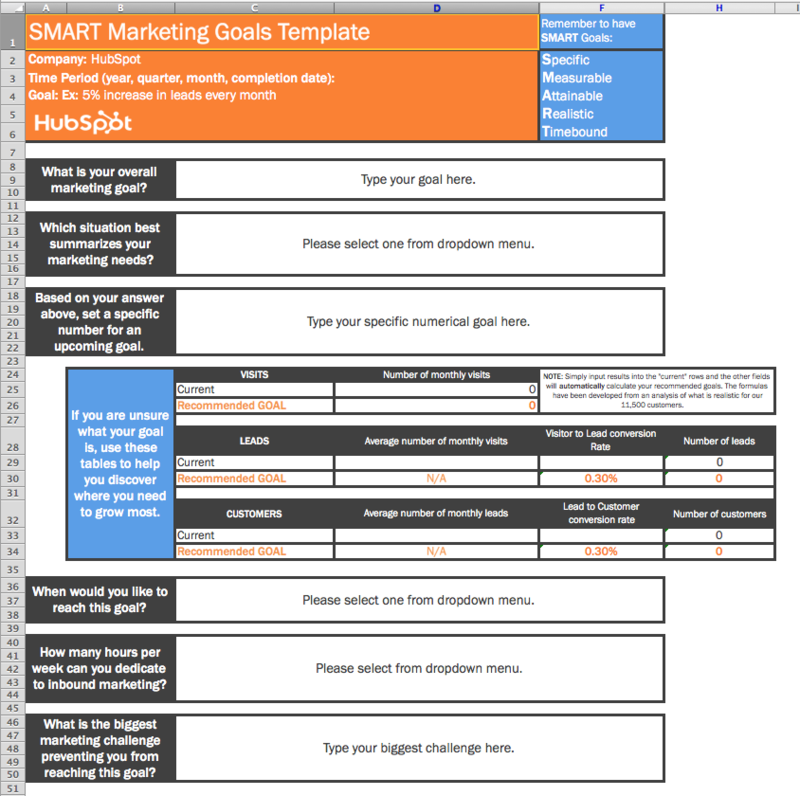 Web Strategies created a handy Excel template calculator to help marketers determine monthly or annual budgets based on revenue each year. This calculator will help your team and executives understand roughly how much budget to request for certain marketing initiatives such as PPC spend, SEO, email marketing, social media ads, and more. 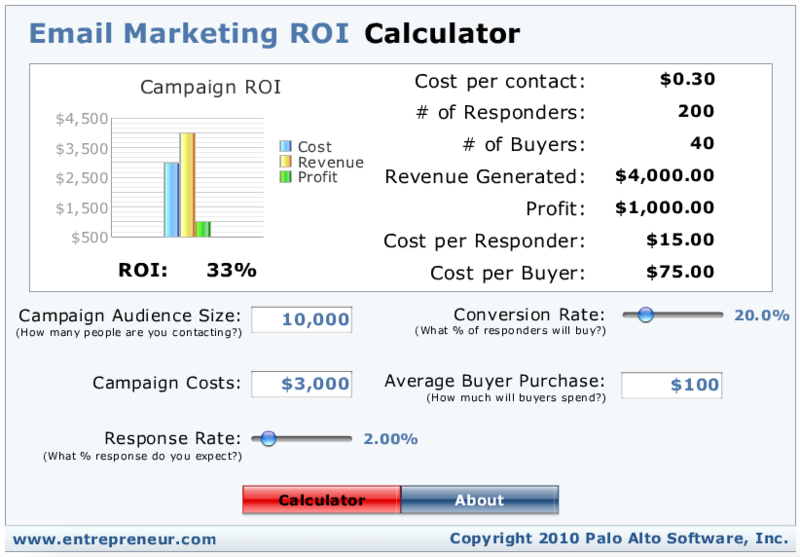 Entrepreneur.com created this online calculator tool to determine the return on investment from email marketing, specifically the cost, revenue, and profit from one email send to the criteria you set (audience size, response rate, campaign costs, etc.). This calculator will help your team understand the value of sending an email campaign and the opportunity to generate revenue on each person that clicks through to close a deal from that email. 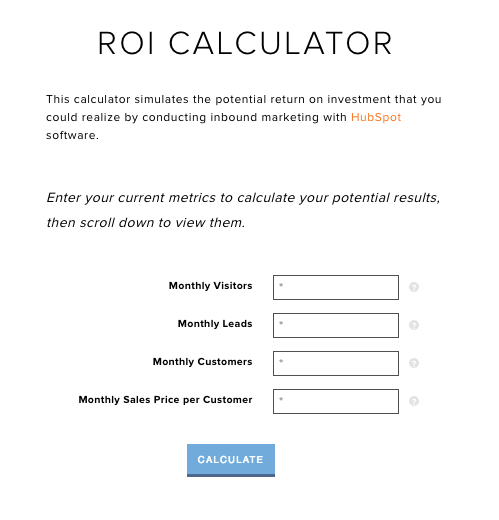 This calculator helps determine the rough estimate of ROI when onboarding to HubSpot. After inputting average monthly visits, leads, and sales price per customer, this calculator outputs an estimated dollar amount increase after using HubSpot for one year. This one will specifically come in handy when proving to execs that inbound marketing and HubSpot is worth the investment. Calculating month over month, year over year, or any type of percentage change to report on requires zero math skills with this easy percent-change calculator. This free tool calculates percentage declines or increases based on the input of two values, so you can easily determine growth numbers in your next executive meeting. Customer Acquisition Cost (CAC) is a well-known and critical metric to study in business. The cost to acquire a customer is essential to understanding the finances of scaling your business, but doesn’t always have to fall under finance’s wheelhouse every month. As marketers, use this calculator to determine how your budget paid off in reporting to execs. Did they give you that extra $10K for paid campaigns last month? Input how many extra customers you saw from that bump in the budget and allow your entire team to see what the cost of each customer is according to your marketing budget. What are your favorite business calculators? Share them in the comments below.